Along with my soup, the sandwich still showed up with a few very good fries (the kitchen had taken some pity on me). 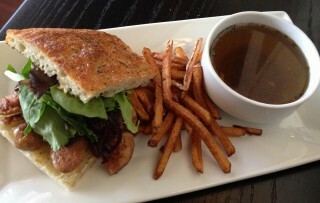 The sandwich was house-made foccacia around grilled sausages and mushrooms, caramelized red onion, and greens. It could have used a bit of mustard punch, but that was solved when I asked for dijon. Once smeared in, it became a very nice sandwich. Company would have added to the pleasure of it. Orleans is desperate for good places to eat. This one is showing promise. St. Martha’s Brasserie D’Orléans, 503-3095 St.Joseph Boul., 613-424-9199.